The U.S. Occupational Safety and Health Administration, OSHA, is a federal government agency in the U.S. Department of Labor. OSHA's web site is https://www.osha.gov. The primary goals of OSHA are to save lives, prevent injuries and protect the health of America's workers. OSHA employs over 2,000 inspectors to ensure job site safety. OSHA was created by the Occupational Safety and Health (OSH) Act of 1970. While many see OSHA as an intrusive government agency intent on enforcing arcane rules, the fact is that OSHA saves lives and jobs. Before OSHA was established, an estimated 14,000 US workers were killed on the job every year. While workplaces today are much safer and healthier, in the US there are still more than 4,500 workplace fatalities each year and tens of thousands serious injuries. That's one reason OSHA offers a Voluntary Protection Plan (VPP) which saves additional money and lives by reducing the cost of injuries, accidents, downtime and litigation. OSHA has a number of workplace regulations covering a broad range of occupations and hazards. Several of these touch on the topic of Safety Data Sheets. The main OSHA regulation concerning SDS's is OSHA's Hazard Communication Standard 1910.1200. The HazCom Standard requires employers to establish a hazard communication program to transmit information on the hazards of chemicals to their employees by means of labels on containers, (material) safety data sheets, and training programs. Implementation of these hazard communication programs ensures all employees have the "right-to-know" regarding hazards and identities of the chemicals they work with, and reduces the incidence of chemically-related occupational illnesses and injuries. With the publication of HCS 2012, OSHA incorporated many elements of the Globally Harmonized Standard (GHS) and made a number of important changes over the previous version, HCS 1994. 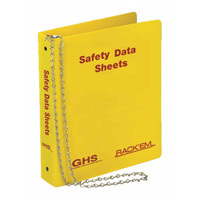 As a result, Material Safety Data Sheets (MSDS) are now simply called Safety Data Sheets (SDS). HCS 2012 specifies an expanded list of *required* elements that must be on an SDS as well as (for the first time) requires all SDS's to be in a standard format which ensures consistency in communicating hazard information. The major changes to the HazCom standard and SDS's and the impact on employers and employees is discussed in our GHS entry - these are profound and important, so we recommend you read those. A comparison of the 1994 and 2012 HCS is available which strikes out the old language in red, inserts new language in green, and has additional commentary on each section. Go to the source! See OSHA's Hazard Communication Site. Great resource. OSHA's publication for small businesses titled "Small Entity Compliance Guide for Employers That Use Hazardous Chemicals. Key Employer Responsibilities under the OSH law. See our annotated version of OSHA interpretations related to the HazCom Standard. Inc's Business Terms Encyclopedia has an detailed entry on OSHA which attempts to take a balanced look at the business vs government aspect of OSHA as a regulatory agency.